Get rid of pest birds humanely with this inflatable predator. Scare Eyes inflate to 18 inch diameter and feature giant eye shapes, appearing to birds as a giant predator. Made of durable vinyl, Scare Eyes feature bright colours around eyes, shiny mylar pupils and tail. Hang where pest birds are a problem and the wind does the rest. Rotate all three colours for greatest effect. Three balloons included: white, black ,and yellow. Includes mylar eyes, mylar tails, and strings for each balloon. The Low Frequency Transonic PRO pest repelled effectively rids areas of bats, mice, rats, and insects, utilizing both sonic and ultrasonic sounds to frighten and disorient them. The frequencies on this unit have been altered slightly to conform to Canadian ultrasound regulatory requirements. Easy to install and use, the Transonic Pro is intended for indoor and protected outdoor applications. Scare Eye Bird Chaser (3-Pack) Get rid of pest birds humanely with this inflatable predator. 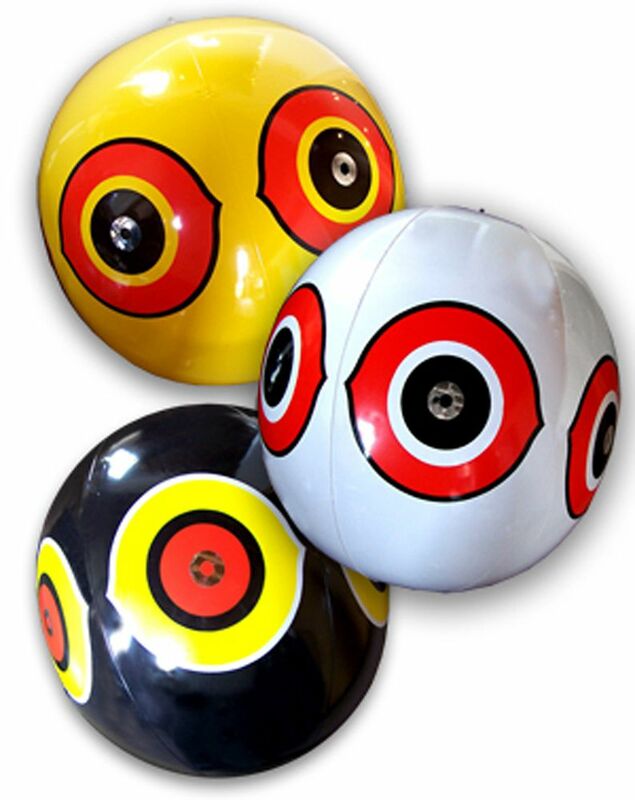 Scare Eyes inflate to 18 inch diameter and feature giant eye shapes, appearing to birds as a giant predator. Made of durable vinyl, Scare Eyes feature bright colours around eyes, shiny mylar pupils and tail. Hang where pest birds are a problem and the wind does the rest. Rotate all three colours for greatest effect. Three balloons included: white, black ,and yellow. Includes mylar eyes, mylar tails, and strings for each balloon.